After much fighting, and apparently being blocked by one of my ISP’s, I got back onto HECnet! 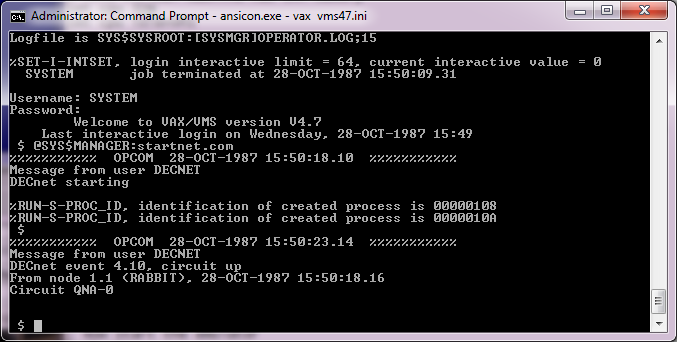 Even better I was able to verify operation with HECnetNT! Like last time I was able to bind Pathworks 32’s DECnet onto a MS Loopback adapter, and then use the bridge to connect onto that loopback to a local Linux bridge (which is also hosting a virtual SIMH VAX instance). The big problems I ran into is that I originally had setup SIMH to use a tap interface, and connect into a bridge, as mentioned on the raspberrypi.org forums, however the HECnet bridge program seems to have difficulty injecting packets onto the bridge interface. I suspect the ‘correct’ thing to do is to remove libpcap from the bridge, and re-write it to be a tuntap client. There is enough examples, I should be able to do this, but I just wanted the thing to work, so I didn’t want to tackle this just yet. Instead I had SIMH attach to the Linux lo adapter (typically where 127.0.0.1 lives), and the HECnet bridge program, and success!  Even better the interface has been up now over 12 hours since it was brought online. Want to learn more about HECnet? simply check it out! But as the short order goes it’s a hobbyist DECnet of machines spread out across the globe running the ancient DECnet protocol on various legacy style systems. what is more fringe than a telnet bbs? I found a simple c server and client program that was ported to decnet. And it was easy enough to follow I thought I’d try something fun. So I took Synchronet 3.00c and started to identify the winsock tcpip portions and then slowly alter them to either stubs or being more decnet friendly. Surprisingly this wasn’t so hard. 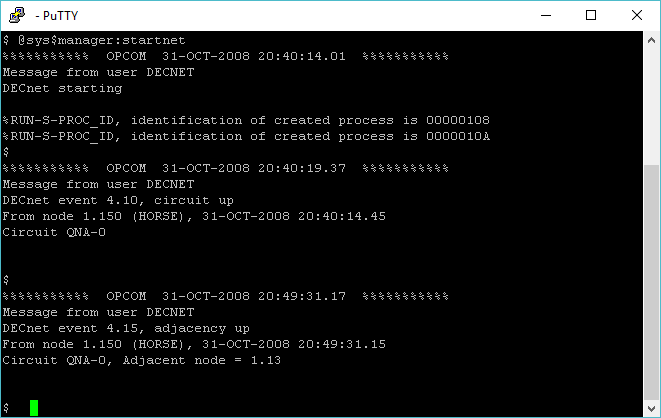 The hard part is that decnet doesn’t have a telnet like protocol, and I don’t have enough patience to try to reverse how ctermd works, so with a lot of searching I found a semi simple telnet client and mostly got it running on decnet. Right now I have issues resolving address, so it is hardcoded. I have to admit it was pretty cool to see the first connection, even though it aborted when it couldn’t figure out my ip address. I made some more changes, and it worked!! 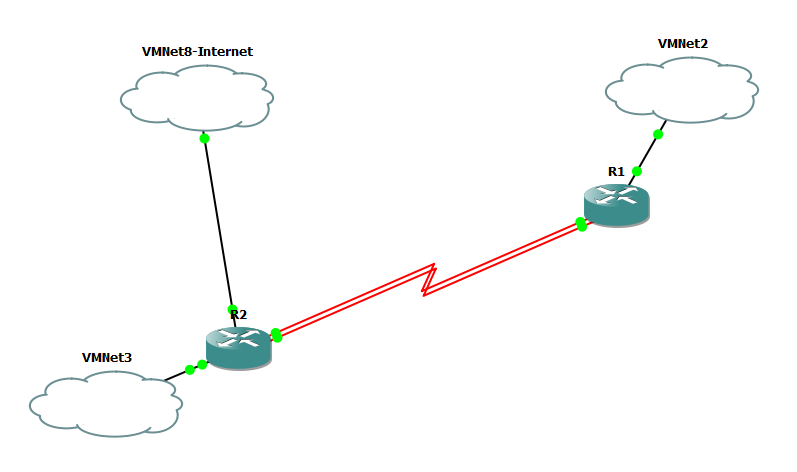 The next step was to fire up gns3 and build a simple 2 area decnet network and see if a NT box from area one could connect to a bbs in area two. 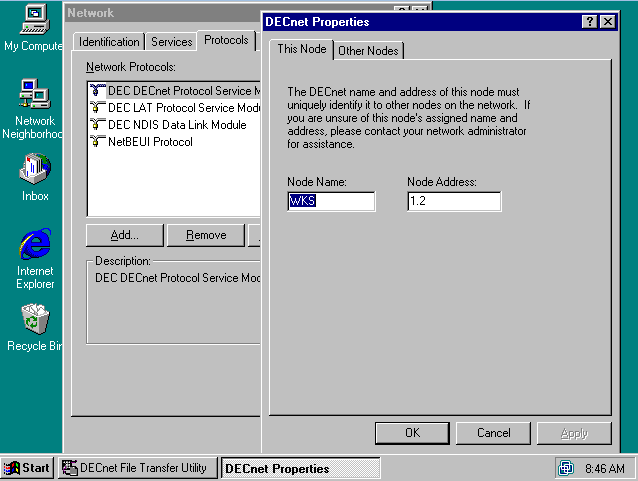 And with a few false starts I finally got a working multi area network (decnet isn’t like tcpip!!) This document on cisco’s site was invaluable. As you can see this is pretty simple. I wanted two serial connections so I could run DECnet on one serial connection, and TCP/IP on the other. This way I could shut down the TCP/IP connection to ensure my conversation was 100% over DECnet. As you can see the configuration is pretty simple. I went with RIP because it’s a small network, and I only need a few routes. 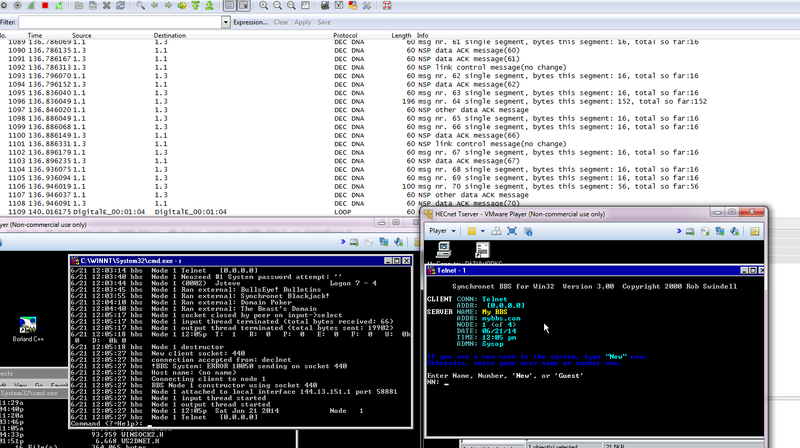 EIRP, OSPF and friends are just pure overkill. 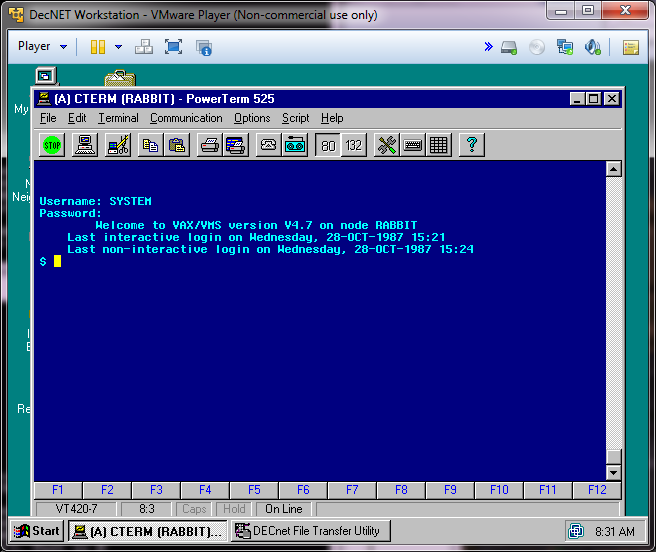 And recall VMNet8 is the NAT interface provided by VMWare Player. Everything is looking good! I fired up my DECnet telnet and success!! 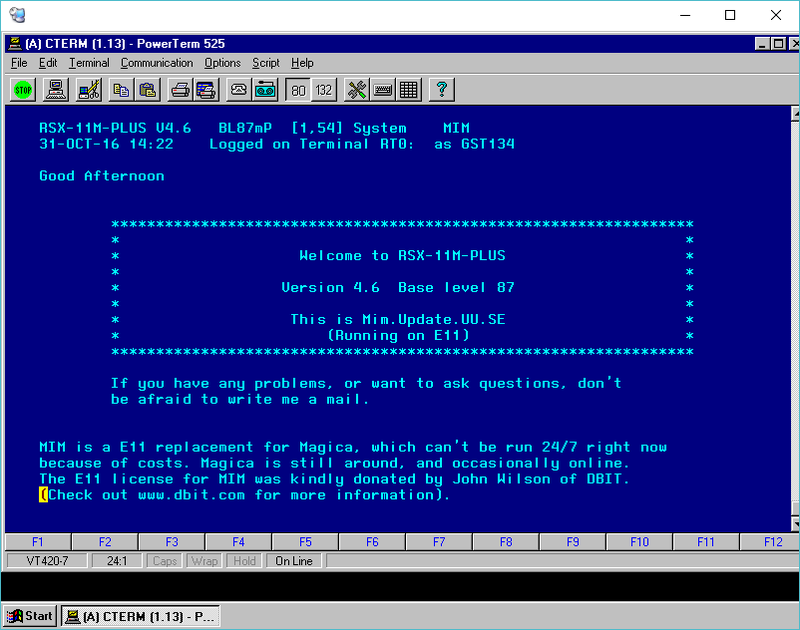 Author neozeedPosted on June 21, 2014 June 23, 2014 Categories DECnet, HECnet, microsoft windows, synchronet, telnet, virtual networkingLeave a comment on what is more fringe than a telnet bbs? So I have my little project working well enough to let it out into the world. I call it HECnetNT, and it’s available out on sourceforge. It’s a port of Johnny Billquist‘s bridge program to Windows. This isn’t a MinGW or Cygwin build, but rather, a native build, compiled in Visual Studio 2003. I’ve been able to run this build on NT 4.0, 2000 and Windows 7. I also made some additions to the bridge program, by allowing it to bridge IPX/SPX Ethernet_II frames, so you can now build legacy networks that let you logon to NetWare servers, or even play those old IPX/SPX games. Back when I first got DOOM v1.1 working on IPX/SPX I noticed that it sent an incredible amount of packets that were mostly empty. 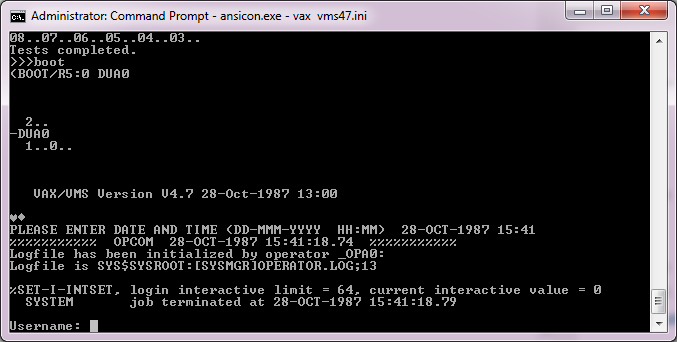 To work around this, I incorporated LZSS to compress data between HECnetNT bridges. 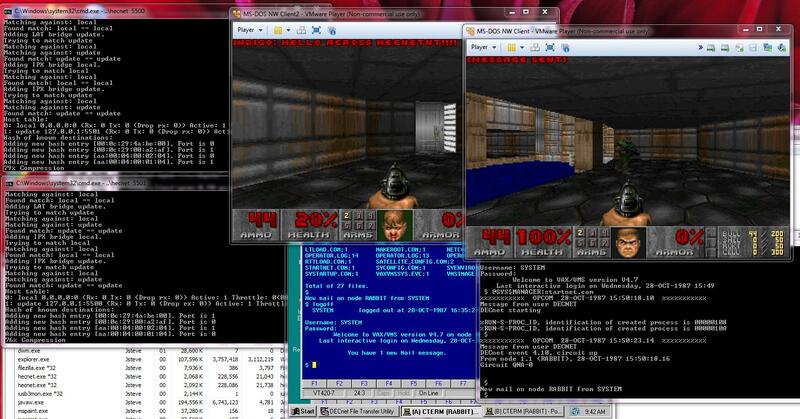 Even better, I don’t see any significant CPU utilization, even with DOOM blasting packets like crazy! The best part is that you can mix compressed & uncompressed bridges. So you can have an uncompressed connection to one host, and a compressed connection to another. I’ve been able to bridge CTERM with SIMH to hosts using compressed, and uncompressed links, and this also includes a LINUX box with the original bridge software! 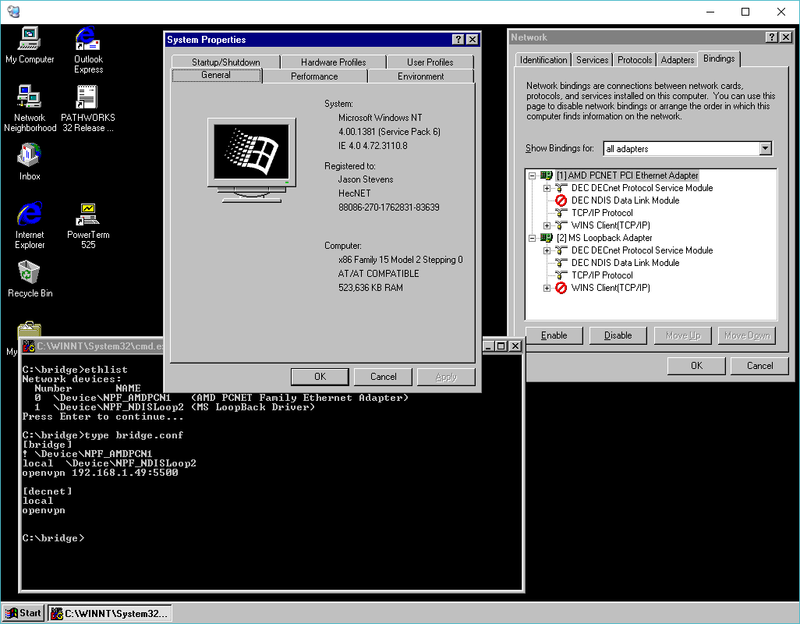 To take it one more step, I also setup a Windows NT box with an ethernet adapter, and the MS LOOPBack adapter, setup TCP/IP on both interfaces (a dummy address on the loopback is enough, but there needs to be something there), and then installed DEC Pathworks 7, on NT, bound it to the loopback adapter, ran the HECnetNT software, and I’ve been able to connect my NT instance. Logically I could go one more step, and install PPTP support, so I the NT server could then use PPTP to VPN to a HECnet bridge, and then join it. So the larger question is, the DECnet enthusiasts have their hecnet, is anyone interested in making a Novell like equivalent? With older Linux that supports IPX/SPX or even NT we could even do routers, and build a large-ish sized network. Author neozeedPosted on June 10, 2014 June 10, 2014 Categories DECnet, Novell Netware 3.12, virtual networking3 Comments on Announcing HECnetNT!